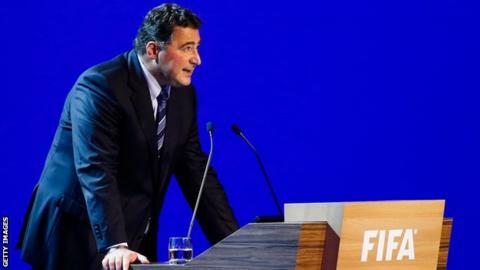 Fifa has said its reform taskforce will be chaired by an independent person from outside of football. The Swiss businessman is already the independent chair of Fifa's audit and compliance committee. Scala was believed to have been prepared to lead the taskforce, after meeting presidents of three of Fifa's six continental confederations. But a spokesman for Scala told BBC Sport: "Domenico Scala never applied for such a chairmanship." He added that the post would only be considered "under the strict condition" that "independence was guaranteed". What is the Fifa reform taskforce? As well as an independent chair, the taskforce will have two representatives from the AFC (Asia), CAF (Africa), Concacaf (North, Central America and the Caribbean) and Uefa (Europe), as well as one representative from each of Conmebol (South America) and the OFC (Oceania). In a statement, Fifa said representatives from federations would not necessarily have to be "members of the football community" and the confederations could decide that themselves. Blatter, who has announced his intention to stand down as president, has said presidential term limits and integrity checks for top officials are potential areas of reform. Recommendations are due to be presented at the next meeting of Fifa's executive committee in Zurich on 24 and 25 September. The prospect of Scala leading an independent review of Fifa was described as "laughable" by campaign group New Fifa Now. And Alexandra Wrage, who resigned from Fifa's independent governance committee in April 2013 in protest at a lack of meaningful action, said even an independent chairman of the reform taskforce "can't work". She told BBC Sport: "The process needs to be taken out of Fifa's hands. Short of that, it's another reform dead-end." Blatter's resignation on 2 June followed the arrest of seven Fifa officials as part of a United States investigation that saw 14 people indicted on corruption charges.